Frankincense – a traditional staple of the Christmas story – faces an uncertain future, according to researchers. Ecologists have warned that the production of the fragrant resin could decline by half over the next 15 years. The festive fragrance is produced by tapping the gum of trees in the Boswellia genus. The findings, based on a study carried out in Ethiopia, have been published in the Journal of Applied Ecology. It is used extensively in religious rituals and in the perfume industry. It has also been investigated for its medicinal properties. “There are several reasons why the tree species Boswellia papyrifera is under threat,” explained co-author Frans Bongers, an ecologist at Wageningen University in the Netherlands. The small trees, which generally reach a height of no more than 5m (16ft), grow in steep, rocky habitats, providing cover for other plant species. Each year, up to about 3kg of resin can be tapped from an individual tree. 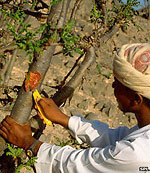 After about five years of tapping, management techniques suggest that the tree should be rested for a similar period in order to maximise future yields. The genus Boswellia, overall, is generally classified as Vulnerable as a result of habitat fragmentation and poor levels of rejuvenation, explained Prof Bongers. “If the tree germinates, then there is a small plant coming out of the ground, but then in the next dry season it goes down again because it is too dry,” he told BBC News. Prof Bongers added that the encroachment of more opportunistic tree species was also affecting the long-term survival of the frankincense forests. “In the landscape, this tree has been the dominant species. That is why we can call it a frankincense forest, just like we can refer to beech woodlands in the UK,” he said. “In these woodlands, 80% of the individuals are frankincense trees. Yet some areas at the verges of the distribution of the species, there are other species coming in. The study examined 13 two-hectare plots, which involve monitoring more than 6,000 trees and collecting more than 20,000 measurements. Using this data, the team modelled the fate of the species, and found the current levels of frankincense production is set to halve in the next 15 years. “Current management of Boswellia populations is clearly unsustainable,” Prof Bongers warned. “Our models show that within 50 years, populations of Boswellia will be decimated, and the declining populations mean frankincense production is doomed. This is a rather alarming message for the incense industry and conservation organisations.” He added that tapping the trees for the valued resin was unlikely to be the main cause of the decline. Instead, there were a number of other things affecting the long-term future of the trees. “Frankincense essential oil extraction is unlikely to be the main cause of population decline, which is likely to be caused by burning, grazing and attack by the long-horn beetle, which lays its eggs under the bark of the tree. In the areas they studied, the team found that older trees in the population were not being replaced because few Boswellia seedlings survived to become saplings. “The number of fires and intensity of grazing in our study area has increased over recent decades as a result of a large increase in the number of cattle, and this could be why seedlings fail to grow into saplings. At the same time, a large proportion of trees we studied died after being attacked by the long-horn beetle,” Prof Bongers observed. In order to ensure future rejuvenation, he suggested that areas should be set aside for up to a decade so young Boswellia trees could become established. Frankincense is an oily gum resin from 16 different species of tree of the Boswellia genus. Incense extracted from the resin is used in religious rituals, but has also been investigated for its medicinal properties. It is believed to be an anti-inflammatory and relieves the symptoms of arthritis. 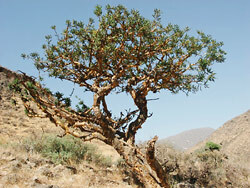 Frankincense is tapped extensively wherever the Boswellia trees grow. Its high value comes mainly from the fact that it is used extensively in religious rituals, particularly in the Islamic and Christian religions and, historically, in Hebrew rituals. The species focused on in this study, Boswellia papyrifera, grows in African drylands. It grows in arid areas so any small, deleterious change could have quite devastating effects on the regeneration of the trees. In this case, it appears to be either fire or over-grazing, but with the general pressures of people and trees depending on the same land, trees tend to lose. If these trees did disappear, it would be a great loss to the local people who tap the trees to sell the resin and to the ecosystem it grows in.